Snakes don't exactly have eyelids. Instead, they have specially-adapted scales over their eyes called eye caps (or spectacles) that help with protection. During a normal shedding cycle, the eye caps usually come off. But sometimes they stay on, resulting in a condition of one or more retained eye caps. What Are Retained Eye Caps? Retained eye caps are a condition during shedding that commonly occurs in snakes with bulging eyes (maybe the eye caps get hung up) or in conditions of low humidity. While there's some speculation on the proper treatment of retained eye caps (or if you should treat them at all), the condition can cause eyesight, duct, and infection problems down the road, should it continue through multiple sheds. It's always best to examine the skin your snake sheds. (Plus, it's pretty cool to see.) The eye caps should be intact upon inspection, meaning there should be no holes where the eyes are. If instead the skin appears to have holes where the eye caps once were, then it's possible they fell away separately from the rest of the skin, or were retained on the snake. To check for the latter, inspect your snake's eyes to see if they are clear or cloudy. Clear eyes usually mean the eye caps have shed, whereas a cloudy or fogginess in one or both eyes can indicate retained eye caps. However, not all abnormal looking eyes suffer this condition. When in doubt, consult an exotics veterinarian who is experienced with reptiles. A common cause of retained eye caps is a lack of humidity in the snake's enclosure. Dehydration, due to low humidity or a sub-par water source, can affect your reptile's health in many ways and can contribute to other shedding problems as well. Mites or a bacterial infection could affect one or both eyes. This often needs immediate attention to restore the health of your pet and maintain proper shedding. 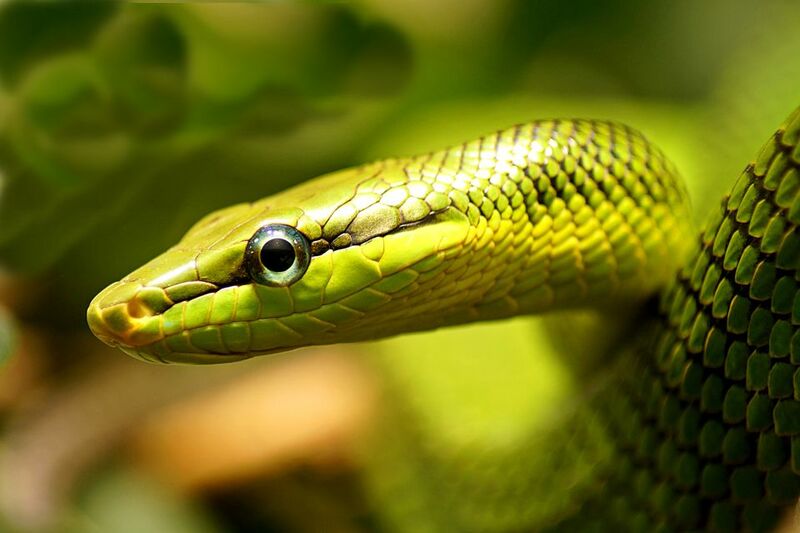 Your snake could have suffered a trauma or injury to the affected eye or eyes, causing it to retain one or both of its eye caps. And malnutrition or a bland diet that's nutritionally inadequate can contribute to shedding problems also. The reptile community offers mixed opinions on the necessity of removing retained eye caps. Some believe you should leave them alone and allow them to come off with the next shed. It's best to consult your reptile veterinarian before choosing the option that's right for your snake. Most times, your vet will recommend a visit to remove retained eye caps so that they don't impair your snake's vision (potentially causing nervousness, aggression, and a reluctance to feed). Retained eye caps can also set the stage for infection to move in, especially if they were retained through multiple sheds. If you observe this condition on your snake, first soak it in warm water (not too hot) a couple times a day. Make sure the water is just deep enough to cover your snake's body and supervise it to prevent drowning. After a few days, the softening of the retained skin may help your snake shed its caps. However, if this isn't successful, a trip to the vet to remove the eye caps may be in order. Some snake owners try to remove the eye caps themselves. If you feel comfortable performing this process, take a piece of clear tape and gently but firmly press it onto the snake's cap. Slowly and carefully peel it off of your pet. When done correctly, the eye cap should stick to the tape when you peel it off. Proceed with caution, however, as this method can cause harm to your snake if the tape sticks to its scales or if you perform this process on an eye without retained caps. When in doubt, bring your snake to your exotics vet. To prevent incomplete shedding (or dysecdysis) in snakes, maintain proper humidity levels in your snake's enclosure. Most snakes thrive in an environment with 50 to 70 percent humidity. Misting your tropical snake regularly also helps it retain the moisture needed for proper shedding. Make sure your enclosure is clean and free of blunt objects to prevent infection or harm to your snake's eye area. Feed your snake a balanced diet, complete with ample water for hydration. Additionally, you can provide a "shedding box" for your snake by placing a damp paper towel into a well-ventilated box. The microclimate inside creates an optimal environment for shedding.